In the legal industry, only a few companies are publicly traded. Back in 2007, an Australian law firm was the first to give it a try. Right now, it is having a real hard time. 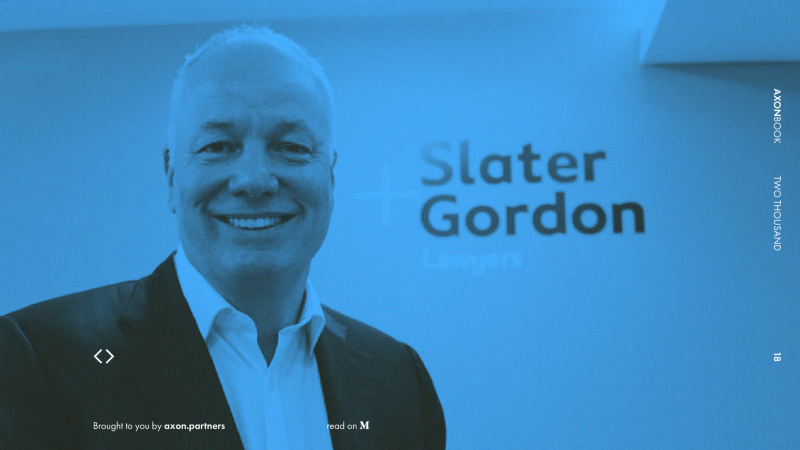 Slater and Gordon Limited (SGH.AX) with its 2,500 employees and $648 million revenue is the biggest law firm in Australia. It’s really hard to imagine how big those numbers are, so I thought I’d compare it with law firms operating on Ukraine’s legal services market. It turns out that by lawyer headcount, Slater and Gordon is as big as the top 50 Ukrainian law firms put together. 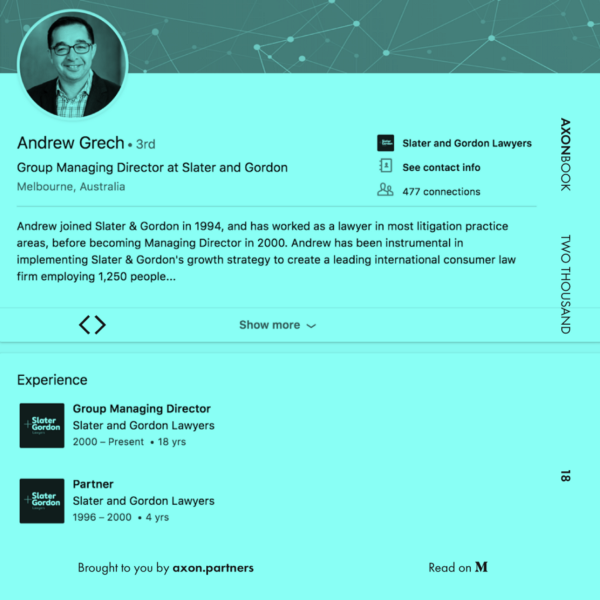 Revenue-wise, Slater and Gordon is 100 times bigger than Asters (a Ukrainian law firm that officially announced it generated 75 million UAH last year). You’re probably thinking that Slater and Gordon are handling huge international arbitration cases or M&A for Fortune 500 companies. Nope, because they are narrowly focused on consumer rights protection. They started as a law firm in 1935 and provided legal advice to employees and employee organizations. Closer to the 1990s, they started handling class actions on a ‘no win, no fee’ basis. Since then, the law firm won numerous cases against the government, as well as against tobacco, financial, agricultural, and other public companies. Since you are here, sign up and read our amazing articles about legal services Medium | Telegram. It was a huge experiment. Libertarian lawyers from Australia kicked everyone in the teeth who believed that practicing law was like practicing art. Sure thing, traditional lawyers were outraged. They kept saying that by going public, the company was industrializing law, and no good could come of it. At Slater and Gordon led by Andrew Grech (it looks like this guy has iron balls), they did not give a damn. After being listed on the Australian Stock Exchange, the company’s shares grew from 1.6 to 2.2 dollars per share. Slater and Gordon entered the UK market in 2012. In 2014, they ranked as the 7th largest international law firm in the City by revenue. At Slater and Gordon, they were obsessed with project efficiency and measured their revenue per lawyer to the cent. Investors love that. So, in 2013, Slater and Gordon’s shares started to rise even further: in March 2015, their shares increased in price from 2.2 to 5 dollars per share. Riding on a wave of success, the guys did over 40 acquisitions in Australia and started buying companies in the UK. This dizzying success was followed by four rapid collapses. In 2016, the company traded at 6 cents per share and lost 90% of its market capitalization. Currently, the law firm is going through a crisis again: their shares have dropped in price to 2 cents, and they keep falling. You can have a look at their financial statements and charts here: https://finance.yahoo.com/quote/SGH.AX?p=SGH.AX. Do you want to know what actually went wrong? Here is what happened. 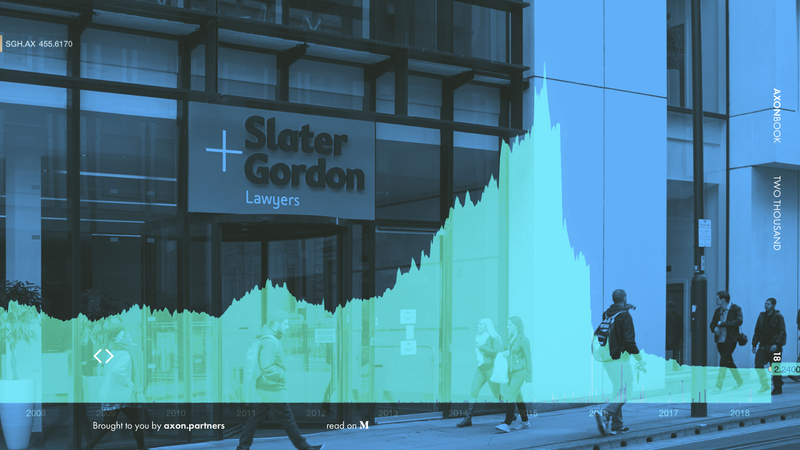 In 2015, Slater and Gordon acquired Quindell Legal Services for a record price of £637 million ($1.1 billion). Following the press release, their stocks jumped. However, three months later, something came out of the blue. Slater and Gordon are still trying to clear this mess up. It turned out that Quindell had been issuing false financial statements, and the UK regulator found out. As a result, Slater and Gordon lost $1.1 billion. Investors scratched their heads and concluded that someone had totally messed up when doing due diligence. They were even madder because the IPO mastermind and all-time leader in the firm’s past accomplishments Andrew Grech got $1.8 million as a result of that annus horribilis. Investors filed a class action lawsuit against Slater and Gordon. As a result, the company’s share price went down the drain. A rumor persisted that Slater and Gordon was going to shut down its offices in the UK. However, they managed to make it through the class action lawsuit. They did really well since it cost them $36.5 million instead of $250 million, regardless of the fact that the shareholders hired Maurice Blackburn, Slater and Gordon’s long-time competitor, to handle the class action. In January 2018, Slater and Gordon announced that the American hedge fund Anchorage Capital Group had gained control over its UK business, so it had nothing to do with the messed up Slater and Gordon Australia any longer. “I’m confident that, in this challenging environment, and with the clear support shown by its new owners, Slater and Gordon is very well equipped to become the leading provider of consumer legal services in the UK”. In the meantime, Slater and Gordon is struggling for its life in Australia. The company’s shares continue to fall. Now they are traded at some 1 cent. It looks like only a miracle can save them. The Blessed Virgin has not yet appeared; however, chances are, they will make it out alive. There is this class action against AMP, the Australian financial giant, and Slater and Gordon are trying to get the client. The law firm offered to provide legal support on a ‘no win, no fee’ basis. They are now competing for the client with three legal giants: Quinn Emanuel Urquhart & Sullivan, Phi Finney McDonald, and Shine Lawyers. As I see it, if Slater and Gordon lose this client, they are done as a publicly traded law firm. So, I’ve been wondering, what if AMP is trying to make Slater and Gordon’s shares fall, just to kick them out of the market before they take the case. The big question is, will the whole going public experiment finally fail? I am sure it won’t. The shares of Keystone Law Group Plc (KEYS.L), Gateley (Holdings) Plc (GTLY.L), and Gordon Dadds Group plc (GOR.L) continue to rise steadily on the London AIM Stock Exchange, while DWF is getting ready for an IPO. So, it was not going public but plain fraud committed by one of the companies Slater and Gordon had acquired that undermined them and resulted in a $1.1 billion hole they couldn’t fill. This is Andrew Grech, the first managing partner to set a law firm afloat. It is 2012, and this man with iron balls and an inexpressive face is opening the Slater and Gordon UK office. He doesn’t know what lies ahead. Special thanks to @Dmytro Mindra (Oracle) for getting me hooked on Yahoo Finance and helping me figure out this whole EBITDA thing.